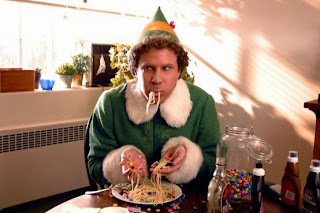 I am totally and completely enamoured with the movie Elf. And I know I'm not the only one! Many of you have told me how much you love Elf too. So when I found out that the creator and owner of Grasse Roots Perfumery acted in one of my favourite Christmas movies ever, I just had to ask her for a behind-the-scenes look. Where did the filming take place and how long did you film for? The film was shot on location in New York City, and some interiors were shot in Vancouver. My time was in New York, obviously, since my scenes were all outdoors in front of one of the entrances to Central Park off of 5th Avenue. I filmed for three days, or rather three nights. In films you sometimes do night shoots where you work all night, and so my call times were usually starting after 6 p.m. I know people think making films is glamorous, and there are definitely fun parts to it, but in truth it's a lot of hard work and long hours! It was cold, and for my scenes I was wearing a fashionable but very thin coat! I remember being so cold at times that I could barely move my lips! They try to keep you warm in between takes by wrapping you up in a warm coat and putting you near the heaters, but after a while you're just cold. A typical day would be arriving on set, getting into wardrobe, going to the hair and makeup trailers so that you're all ready to go, and then... you wait in your trailer! Until they're ready to shoot. Sometimes you might get a rehearsal beforehand, sometimes not. It really depends on so many factors outside of yourself, and your job is to get in and deliver the goods so everything stays on time and on budget! I would usually be heading home as the sun was coming up, then I would sleep through part of the day and get ready to do it again. Buddy has some unusual eating habits. What did you eat on set? Heh heh. I love those eating scenes. To be honest, I didn't eat on set. Probably drank too much hot coffee, but that was about it. There's always food available, but it's hard to get good nutrition on a set. I'd start my work day by eating at the restaurant upstairs at Fairway (a NYC market), then go to work. This was all within ten minutes of my apartment, so I was in the neighbourhood and very much at home. It's different when you're shooting someplace unfamiliar, or in a studio, where you rely on the catering. What was it like to work with Will Ferrell, Zooey Deschanel and director Jon Favreau? Everyone I encountered was most gracious. Will introduced himself to me on set in between my takes and was very humble and friendly. I remember he said, "Thanks for doing this!" with a lot of enthusiasm, and didn't assume I knew who he was, which made me chuckle. He was already famous, but that film made him mega-famous. There were some fun chats in the makeup trailer with various members of the cast - mostly people are just working actors, you know. Jon was terrific to work with, very welcoming, and we hung out next to the heaters quite a bit in between takes to watch the monitors. I remember him saying he hoped that the film would do good things for the actors (he's an actor himself), which stayed with me. I thought that was a generous attitude. Why do you think the movie has become so beloved? The movie has a big heart, which is why people love it. Will Ferrell is at his best playing the sort of innocent "eternal child." I think people connect to their inner child through him. Do you have a favourite line from the film? My favourite line is after Buddy lets out that huge, incredibly loud, long belch, and he looks at Michael and says "Did you hear that?" Hilarious! There are lots of great moments like that in the film. Well, it's about the inner child, isn't it? Everyone wants to be a kid again at Christmas, either through watching their own children open presents, or just being part of the joy of giving and receiving. Maybe it's also because, whatever you think about the over-commercialization of Christmas or the loss of the religious underpinnings of the season, people tend to come together at that time in the spirit of good cheer. For us up here in Canada, it's cold! And there's something wonderful about bundling up and going from house to house and trudging through the snow to someplace warm where friends are waiting for you. Any chance of an Elf 2? No idea. If there is, I won't be among the first to know! Unless they want to resurrect Charlotte Dennon as an anchorwoman, ha ha! I keep busy! Between Grasse Roots Perfumery and my longtime career as an actor, I have a full schedule. After taking some time off to get the Perfumery to a good place, I'm heading back to the Stratford Festival next season to work on a new play. I'm also singing a lot, which I haven't done in years, and have a few opportunities to share that coming up as well, for which I'm very grateful. I'm also slated for a short film in the early summer, and some workshops and readings, which I love doing. My life is very rich and full - I'm never bored! During four seasons as a leading actor at the Stratford Shakespeare Festival, highlights include Tamora in Titus Andronicus, Silvia in Two Gentlemen of Verona and Aricie in Phedre. In New York: Isabella in Edward The Second and the Duchess in The Revenger’s Tragedy (Red Bull Theatre), The Dining Room (Keen Company, Drama Desk Award), Hedda Gabler and Chaucer in Rome (Broadway and Lincoln Center). 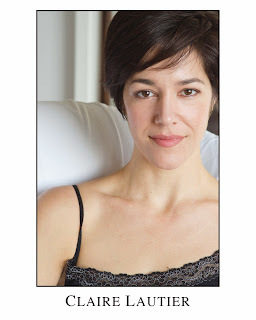 Other favourites include Lady Anne in Richard III and Roxane in Cyrano (The Shakespeare Theatre Company), Princess of France in Love's Labour's Lost (Royal Shakespeare Company and Shakespeare Theatre Company) and many roles in regional theatre, including at Baltimore CenterStage, Westport Country Playhouse, The Walnut Street Theatre, Repertory Theatre of St. Louis, Pittsburgh Public Theatre and New Jersey Shakespeare Festival, and others. Film credits include: Margarita (dir. Laurie Colbert), My Soul To Take (dir. Wes Craven), Ghost Town (dir. David Koepp), Confessions of a Shopaholic (dir. PJ Hogan), Elf (dir. Jon Favreau), House of D (dir. David Duchovny), the short film By Courier (Academy Award nominated in 2001) and The Beach Party at the Threshold of Hell. Television: King, 3LBS, Grey's Anatomy, Numb3rs, Law and Order, Law and Order: SVU, All My Children, Guiding Light, and others. Claire is an honor graduate of Duke University and The Juilliard School. Claire has put together a gift basket of lovely naturally scented products for home and body for one lucky Woman in Real Life reader! Find out more about Claire's products and enter to win here. What do you love most about Elf? Love that movie...it's just hilarious and easy to watch :) Great interview!! Neat! So cool to get some behind the scenes insight. I watched Elf for the first time last year but absolutely loved it. What took me so long?! Will surely be watching it again this Christmas season, maybe making a little get together with friends around it. I haven't see this movie yet but I think I'll check it out. Great interview. THis will be the first year I get to watch Elf with my son, can't wait! So funny that you watch it that often. I think I ask for it more often than my kids! Oh, I love that duet too!! I love the elf food groups. And the way Buddy pours syrup on everything. And the gum he scrapes off the sidewalk and eats. Claire is warm and receptive, devoted to her craft, and a believer in natural health and the preservation of the environment. A joy to know. She is so well rounded! :) Thanks for your nice comment. So fun! I loved learning more about one of my favorite movies of all time!! Thanks, Jo! This post made me think of you and your great Elf embroidery Ruthie! Thanks for sharing - Elf is such a fun Christmas movie although it wasn't until a few years later that I actually saw it - I'm sure we'll watch it again this year!! Slight embarrassment on my side I have never seen this movie. Maybe next time I come up for the wkend you and I, Madison, and Lils can watch while the men go drinking I mean skiing. Its also an excuse for candy cane margaritas. Loved this interview - so fun! 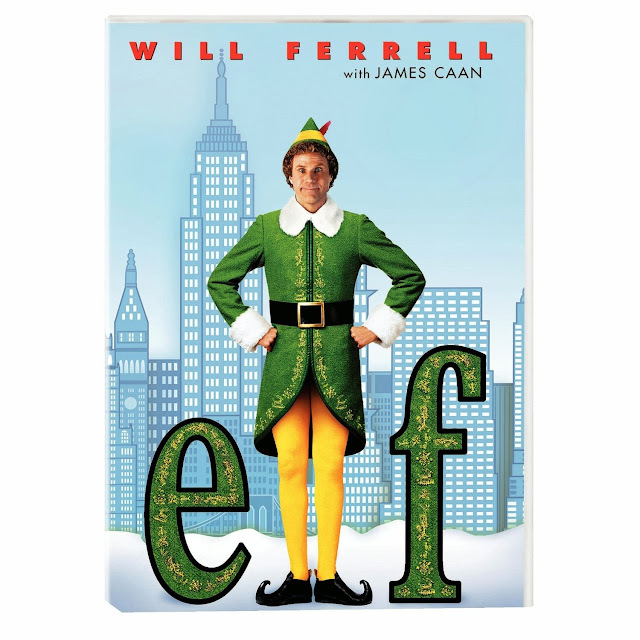 We love Elf - we've watched it 2x's this week already, lol.